(Phys.org)—An international team of researchers has conducted an experiment that shows that the arrow of time is a relative concept, not an absolute one. In a paper uploaded to the arXiv server, the team describe their experiment and its outcome, and also explain why their findings do not violate the second law of thermodynamics. The second law of thermodynamics says that entropy, or disorder, tends to increase over time, which is why everything in the world around us appears to unfold forward in time. But it also explains why hot tea grows cold rather than hot. In this new effort, the researchers found an exception to this rule that works in a way that doesn't violate the rules of physics as they have been defined. The experiment consisted of changing the temperature of the nuclei in two of the atoms that exist in a molecule of trichloromethane—hydrogen and carbon—such that it was higher for the hydrogen nucleus than for the carbon nucleus, and then watching which way the heat flowed. The group found that when the nuclei of the two atoms were uncorrelated, heat flowed as expected, from the hotter hydrogen nucleus to the colder carbon nucleus. But when the two were correlated, the opposite occurred—heat flowed backward relative to what is normally observed. The hot nucleus grew hotter while the cold nucleus grew colder. 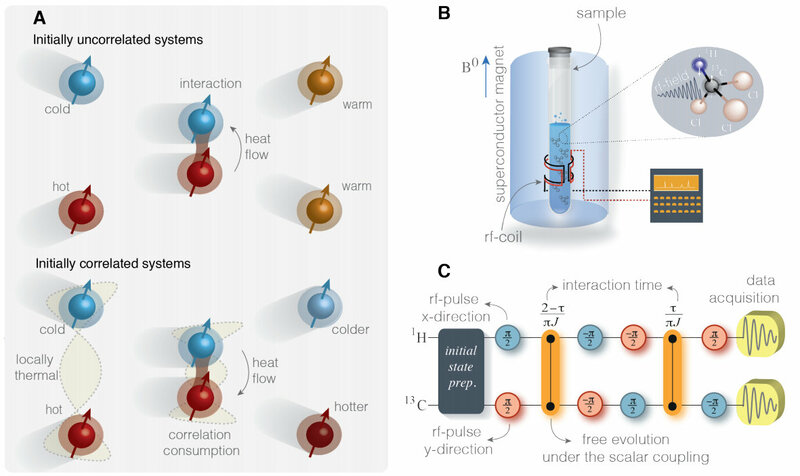 This observation did not violate the second law of thermodynamics, the group explains, because the second law assumes there are no correlations between particles. The second law permits the prediction of the direction of natural processes, thus defining a thermodynamic arrow of time. However, standard thermodynamics presupposes the absence of initial correlations between interacting systems. We here experimentally demonstrate the reversal of the arrow of time for two initially quantum correlated spins-1/2, prepared in local thermal states at different temperatures, employing a Nuclear Magnetic Resonance setup. We observe a spontaneous heat flow from the cold to the hot system. This process is enabled by a trade off between correlations and entropy that we quantify with information-theoretical quantities.